I will make of you a great nation, and I will bless you, and make your name great, so that you will be a blessing. I will bless those who bless you, and the one who curses you I will curse; and in you all the families of the earth shall be blessed. “Luna Digging.” Courtesy of Linda Roberts. All rights reserved. Today is the last installment in this mini-series, “Blessed to be a Blessing: The Leadership Edition.” In the last couple of weeks we have considered ways in which the example of God’s blessing of Abram to bless others can instruct and inspire us in our leadership. Today, I want to add a final thought that, though not clearly stated there, is implied in Genesis 12:2-3. You may recall that God’s generous promise of blessing came at considerable cost to Abram. He had to leave all that gave him security, prosperity, and community. God was going to bless Abram richly, but his life wouldn’t be without loss, sacrifice, and suffering. In a way, we might say that what God gave to Abram was a mixed blessing. When we say something is a mixed blessing, we mean that it has both good and not-so-good qualities. 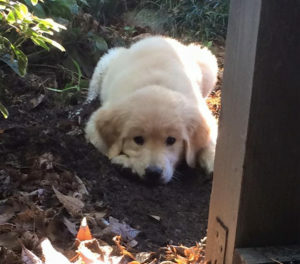 For example, a couple of years ago, my wife, Linda, and I just got a golden retriever puppy. Luna was clearly a blessing. But she also took a lot of work. I had no doubt that, along the way, she’d probably chew up my shoes or dig up my favorite plant in the garden. She was a blessing, but a mixed one. Still, Linda and I were thrilled to have her. Leadership is a mixed blessing. If you’re a leader, you know this. I don’t really have to say much more. You know the joy of influencing others for good results. You have seen how your leadership can lead to fruitfulness for your organization and those connected to it. I expect you have enjoyed some of the adventure of leadership, the chance to dream, to envision, to strategize, to implement, to collaborate. You may well have been rewarded for your leadership, with financial gain, affirmation, or greater opportunities to lead. So far, so good. But then there’s the other side of leadership. Leaders inevitably seek to change things that at least some folks don’t want changed. Thus, leaders can become targets of criticism and downright meanness. Sometimes leaders make mistakes, errors that are costly to themselves, their businesses, and the people whom they lead. Leaders are usually faced with the problem of people who resist their leadership and act out their resistance in immature ways. There are times when the burdens of leadership can be extremely heavy. Leaders can feel profoundly alone and discouraged. So, leadership is clearly a mixed blessing. It was for Abram. It was for David. It was for Paul. It was for Jesus. And it will be for you, too. Yet, we accept the downside with the upside because we understand that our leadership is not just a blessing, it is also a calling. It is part of how we respond to the call of God on our lives. It is a faithful response to what God has given us. Our leadership is an expression of our love for the Lord. We know that God is honored not by our success but by our faithfulness that recognizes God as the one whose blessings enable us to bless others through our leadership. When you think of leadership as a mixed blessing, what comes to mind? What helps you as a leader to be faithful in hard times? When have you experienced the joys of leadership most fully? Gracious God, leadership is indeed a mixed blessing. It comes with so many benefits and is filled with so many gifts. Yet, our leadership also comes with pain and loss. There may even be times when we’d just as soon stop leading because it’s just too hard. Thank you, Lord, for being with us in the great times and the hard times. Thank you for your faithfulness, for the blessing of your presence, your wisdom, your comfort. Help us to be faithful in response, to serve you with all that we are, trusting to you the results of our efforts. May we live and lead with consistent courage and gratitude, by your power and for your sake. Amen. This post originally published on September 22, 2015.